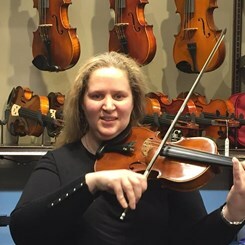 Teresa has been teaching the violin and viola for over 12 years. She has taught students who are beginning their musical studies and students who are advancing. Teresa works with her students to develop their musical skills. She tailors each lesson to the individual student to give the student a great learning experience. Several of her students play with their school orchestras and orchestras in their communities. Teresa enjoys seeing her students make progress in their musical studies. She graduated from Georgian Court University with a BA in Music and Education. She has taught music in both public and private schools to students in kindergarten through high school. One of her proudest moments teaching in school was when her students performed The National Anthem at a BlueClaws Baseball game. She is currently performing with the Kean Preparatory Youth Orchestra (KPSO). She occasionally plays for special events and community events. Teresa enjoys playing many styles of music. She plays with the DeBows Bluegrass Band. She has competed in a few fiddle competitions where she has won awards. Request Lessons with Teresa McGayhey today!